Combining the art and science of landscape construction and design. Howdy folks, my name's Brent Alford. I started mowing lawns when I was eleven and transitioned into landscape architecture and construction during high school. I had tax ID numbers before I had a driver’s license. During college at TCU I had planned on a career in the Army, these plans were somewhat derailed by the fall of communism. So I just kept doing what I knew best. Alford's Landscaping has the experience, the creativity and the style to create forward or backward thinking designs and implement/build them from the drawing board to your kitchen carving board. I take pride in the fact that we don't deserve clients, we earn them, one commission at a time. We take pride in our work and the value we can offer. Cut-N-Edge Lawn & Landscape is a premier landscaping company in the Rockwall-Heath area. With over 20 years of experience, it translates into our work. We provide luxury landscape projects that start with design and end as a masterpiece. Each project starts with a consultation; this allows for us to understand the desired look you wish to achieve. Next, we design a landscape plan which will mimic the exact look & dimensions of the project. After you approve the plan, our team will begin the installation process. Once finished we will clean up the worksite and present to you a finished landscape of your dreams. We understand that to always have a beautiful landscape it needs to be adequately maintained which is why we offer on going maintenance programs. 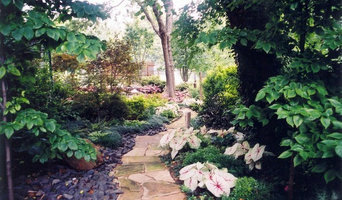 Scapes Inc. is a full–service landscaping design/ build contractor serving the greater Dallas Area. We provide landscaping solutions for both homes and commercial properties. Specializing in high–end, beautiful landscapes, we can transform your outdoor space into a relaxing sanctuary, beautiful entertaining space, or a functional outdoor living area. For over 30 years Bonick Landscaping has served Dallas area clients with the highest standards looking for out-of-the-ordinary luxury landscape designs and pools by offering the best in service, workmanship and plantings. Services include landscape and hardscape master planning, pool design, pool construction and installation, estate management, lawn and garden maintenance and more. For discerning clients in Dallas who want to express their own distinctive style through their landscaping, Bonick Landscaping can help you realize your dream. Elite Outdoor Living is dedicated to providing exquisite and unique outdoor environments designed to meet each of our client’s specific needs and lifestyles. Elite Outdoor Living staff members consistently strive to exceed our customers expectations while fulfilling our motto of "...extending your personal space outdoors”. We pride ourselves in having a keen eye for detail and adding aesthetic value. Not only do we hold ourselves to the highest of ethical and industrial standards, but we truly care about our clients and are dedicated to completing our project on time. Our goal over the years has been to build lasting personal and business relationships through honesty and great communication. We will continue to offer the highest quality craftsmanship with a value most can afford. We look forward to assisting you with all your outdoor living needs!! "Personalizing the home garden industry" Our products, designs, services and personal touches delivered to our clients will exceed their expectations. The Plant Concierge, LLC believes quality care and customer service is what people are missing from their landscape companies. We target individual plans and recommendations to suit your home garden needs. EVERYONE IS NOT THE SAME! Specializing in landscape maintenance from the soil to the trees, landscape design, and Installation. Over 40 years combined experience; we would like to show you why our clients believe when it comes to quality and customer service, WE ARE #1! Full service design and build contractor providing custom outdoor kitchens, outdoor fireplaces, patios, arbors, pergolas, decks, outdoor fire pits, custom stonework and hardscapes, fences, water features, retaining walls and a variety of remodeling, renovations and home repairs. Beautiful Backyard Living is the premier provider of backyard living solutions in the Dallas – Fort Worth Metroplex. Whether you desire a remodel or renovations or seek to construct a custom designed project, Beautiful Backyard Living is your partner of choice. Locally owned and operated, Beautiful Backyard Living is a full-service design and build contractor. We pride ourselves in providing the finest quality workmanship and utilize only the finest materials. We make every effort to maximize your value with every project while managing costs in order to remain competitive. We will honorably and ethically use our company's resources, talents and capabilities to optimize the value of the company for our customers, employees, suppliers, shareholders, and communities. Mikhael Cook is the owner of Fallen Leaf Landscaping. After years of working for other landscape companies, Mikhael discovered his passion and eye for constructing and beautifying the outdoors. He decided to give it his all and start a company of his own that would always strive to put customers first. Fallen Leaf Landscaping was founded September 2012. Locally owned and operated, Fallen Leaf Landscaping is dedicated to quality service and helping to make your vision become reality. We are always willing to give our unbiased advice to ensure that your finished product is long lived. No project is too big or too small, and we will always strive to see that every client receives the highest level of professionalism and service. Welcome to Star of Texas Landscape, a premier design/ build landscape firm that has multiple crews on staff that cover landscape, hardscape, swimming pools, irrigation, and all types of stonework. We take a project from initial conception in house without having to deal with multiple contractors. We have a passion for the outdoors, and working with Mother Nature's beautiful environment. Let us help you find the beauty hidden within your property, whether it is a small garden lot or multiple acres, we have the experience to bring out the best. Bryan Swenson has been designing unique and beautiful landscapes in the metroplex for over ten years. A long time water feature specialist, he has an affinity for natural stone and art in the landscape. 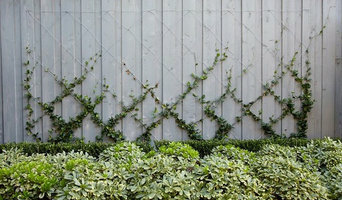 Native and naturalized shrubs, trees and perennials play a major role in all of his designs. With a Landscape Architecture Degree from Texas A&M University, he feels lucky to work in a field that he is passionate about. We have more than 25 years of construction experience in outdoor living environments. 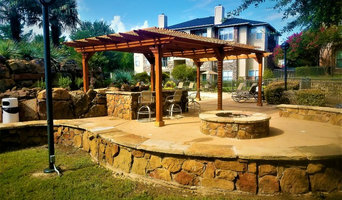 Our services include Design, Consulting, & Construction of residential and light commercial work for outdoor kitchens, pool cabanas, swimming pool remodeling, outdoor fireplaces, fire pits, pattern concrete, Belgard pavers, stone walls & walkways, landscaping, outdoor lighting, arbors, pergolas, & patio covers. Call us today to see what we can create for you. At Farnham Landscape our mission is to build long-term relationships with our loyal and perspective clients by supplying the highest quality services available in the industry today. We are committed to excellence and dedicated to our clients long-term satisfaction. Our reputation is important to us and that is why we work hard to understand and satisfy the needs of our clients. To accomplish this we strive to be accessible and dependable, while displaying personal pride in everything we do. Our designs are unique and innovative - our recommendations are technically sound - our quality is unsurpassed. At Pro Cut Lawn Care and Landscaping, we take care to provide our customers high quality services personalized for their unique needs. Our professional, courteous and efficient staff members are happy to provide Plano lawn service and landscaping for both residential and commercial properties. We have built a reputation for inspired design thorough knowledge and unsurpassed customer service, we also have provided superior lawn and landscaping services to all local businesses and homeowners since 1986.